Why choose Imperial over a cheaper competitor? HOW IS IMPERIAL DIFFERENT OR BETTER? Imperial Floats manufacturing process is not subject to the cost-cutting practices typical of the mass-produced overseas float manufacturers. To our knowledge, ALL of our competitors overseas floats are mass produced by factories that make floats for most of the imported brand names that have popped up in recent years. None of these float vendors actually make their own products nor have any meaningful control over the quality of their products. The only way these factories can be competitive is to offer the Australian vendors a very low price by using the cheapest available (often recycled) materials and labour otherwise the next factory will. Nothing great was ever produced using the cheapest materials and labour! Imperial floats are built in our dedicated 6400 square meter factory by over 80 of imperials qualified fabrication staff and we do not manufacture anyone else’s products. Using state of the art equipment and advanced robotics imperial is able to produce a world-class quality product at an unbeatable price point. All of our floats are CAD (Computer Aided Design) designed by our own qualified engineers allowing us to comprehensively stress test our designs and achieve a market leading engineered load balance and component fitment ensuring everything just works. Our ethos is simply to build a great quality float at a great price point. The first part of that statement is where we differ dramatically over our competitors. Whilst our prices are similar to our low price competitors, that’s where the similarities end. If you are interested in the technical differences, we would love to share those in detail in a conversation though for the sake of this overview, here are the highlights. While mass manufacturers typically use recycled steel due to its lower cost, Imperial floats only use A grade, Australian BHP engineered virgin steel. Recycled steel is made up of numerous different materials that can include car bodies to cutlery blended together leading to material strength and quality deficits. Our floats are designed from the ground up by our team of qualified engineers using the world’s leading 3D Cad Engineering software, Solidworks. Solidworks 3D CAD software is used by Nasa and Boeing Aircraft corporation to design and test their airframes inside their computers before they are physically built with absolute precision. Imperial harness this powerful tool to do the same. We simulate the harshest treatments and load scenarios to ensure the service life of each imperial float is second to none. This world-class engineering software has also allowed us to engineer a perfect weight balance between the axels and the drawbar leading to one of the best towing floats on the market as well as the most reliable. Proper dual process hot dipped galvanizing is expensive and takes time. Most Chinese manufacturers will save time and money by single dipping their product as it looks reasonable to the untrained eye. A single rapid dip is faster and much cheaper though leads to very thin galvanic adhesion with most of the molten coating draining away as it does not have time to chemically bond to the substrate correctly. The second coat is even slower as the metals must now anneal and chemically bond to each other to form a proper monolithic bonded coating. Imperials true dual hot dipped process creates a 70+ micron coating that is far thicker than our competitors and rated with a service life exceeding 100 years. Quality timber is a tried and tested flooring product and for many reasons, it’s a good choice. It does, however, have one major deficit and if left unchecked it can lead to disastrous results for your horses. In 2009, Imperial was the first float manufacturer in Australia to introduce a 25mm rot proof high-density multi-strand fiberglass floor to overcome the rot typical of timber floors when they became moisture affected from horse urine and wet weather road use over time. 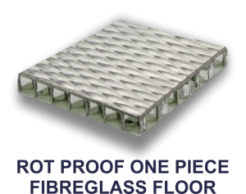 Since that time, many copycat vendors have introduced a 25mm fiberglass floor claiming the same benefits and longevity. Point of fact, Imperial floors were custom engineered and tested for over 18 months prior to the first install and exclusively proprietary to Imperial. Our floors actually cost more than double that of a timber floor to fabricate and install but it will never rot and your horses will never fall through it. Competitors products so far have been little more than cheap imitations using single weave low-density fiberglass and plastic center infills as that is a much cheaper way to build a fiberglass floor and to our knowledge, none have proven successful. A client recently reported to us that an Imperial lookalike vendor had to recall 17 floats due to significant floor failures with most of the floats 6 months old or less. The reason behind the failures is simple. While these floats may use a 25mm fiberglass flooring product, the 19mm centre of the 25mm (76%) is actually low-density polyethylene plastic (LDPE). This is the same material used in disposable drink bottles encased by single-strand fiberglass weave and not remotely close to the strength of our purpose engineered multi-strand high-density FRP product. Imperials flooring product is heavily reinforced and was specially engineered from day one to withstand the weight and rough treatment of horse carriage. Again, cheap materials are never better and often simply don’t work. Atop our purpose made fiberglass heavy duty flooring and our walls sits our thematically sealed dimple finish, Pirelli 10mm non-slip rubber flooring providing further protection, ease of cleaning and comfort. All of this is sealed in with industrial grade UV stabilized Sikaflex 291 as used by Sea Ray and Bayliner boats to chemically weld together massive boat hulls to designed to endure the worlds harshest conditions for decades. Most heavy load trailers will use one of three types of suspension though, in the case of the Chinese manufacturers, this will often be dictated by price rather than ride quality, safety, capacity, and function. Imperial takes great pride in its use of heavy duty self-leveling Rocker Roller suspension system with an articulating load sharing pivot shackle that evenly and actively distributes the load. This allows for a greater carrying capacity with outstanding ride comfort and towing characteristics. Many of our clients provide feedback that their imperial float is easily the best towing float they have ever owned. In contrast, a lot of Chinese manufacturers will use a much cheaper slipper spring system that is locked to the chassis providing a harsh ride with low impact absorption capacity and can cause the wheels to skip on rough roads. This can lead to a very dangerous fishtailing when the wheels break traction, particularly around corners on dirt, gravel and wet weather. lately and largely driven by Australian vendors seeking to avoid a lawsuit, there has been a shift in Chinese float manufacturers toward a torsion rubber suspension system. This system design was originated in Canada using high-density poly-acetate infused rubbers that are expensive and will last a long time. This suspension system overcomes the wheel skip issue and does provide a nice ride though does not provide load sharing properties. Now for the disappointing part. The Chinese version uses recycled car tires for its rubber and is around 1/4 of the price of the original product with much shorter service life. Furthermore, the Chinese system is notorious for rapid decline failure which simply means that you get very little warning before the rubbers collapse and break apart. Imperials Rocker Roller load sharing suspension system uses induction hardened and variable heat tempered heavy duty springs that simply do not fail nor falter nor allow for wheel skip whatsoever due to their self-leveling quad wheel articulating design. Imperials Rocker Roller system easily provides the best combination of overall ride quality, load capacity, safety, and reliability for decades without issue. Imperial only select first-grade heavy-duty fittings, raw materials, and composites designed and tested to withstand the rigors of horse carriage and outdoor exposure. All of this leads to a product you can be proud of and confidently rely upon to get you and your horses there and back in one-piece time and time again. We tested our unique multi-strand dual weave roofing on a 40 degree direct sunlight day and even after several hours, the inside of the roof was cold to the touch whilst outside, the direct heat was unbearable. Imperials multistrand dual weave fiberglass roof is typically twice the thickness of many of the cheaper floats. Why is this important, The thinner roofs not only provide far less thermal protection for your horses effectively cooking your horses in warm weather via radiant heat, they allow the upper body of your float to flex whilst driving leading to steel joint and weld toe stress fractures with a weakening of the upright steel frame over time. Imperial only use Zincaneal coated A grade sheet steel that is chemically bonded with German made BASF etch primers. Atop that, two coats of 2 Pac hard coat automotive paints are applied and baked in our commercial paint booths to create a very tough and long-lasting finish. In contrast, many (built to a price) float manufacturers do not possess the expensive professional baking ovens required nor will they allocate the time needed to bake the base coat to activate the polyisocyanate resin catalyst in preparation for the top coat as this is what’s required to achieve a rock hard and enduring finish. That is how 2 pac paint is designed to be applied. A low-cost workaround method is to spray one heavier single top coat and then air dry the float in the sun. While the end result may look the part when you first see it, the paint and hardener have never catalyzed as they require sustained high temperatures upwards of 65 deg Celsius to do so. Unfortunately, when these manufacturers employ the workaround method, you end up with a soft low density, high porosity paint finish that leads to multiple issues over time including a painted surface that can stone chip easily and lead to premature body rust. None of this takes into account the requirement to strip the float back to bare metal to repair the problem, you simply cannot spray over uncatalyzed 2 pac paint. When Imperial entered the horse float market back in 2003, the standard Australian float warranty varied between 1 and 2 years. Imperial changed the face of the market forever by confidently offering a 5-year structural warranty with every float. Imperial not only carries the largest stock of floats in Australia, we also carry a huge range of parts for every component of our products along with a distributor network that spans the country. No matter where you are, you can be confident that we can and will support you and your purchase for many years to come. In 2015, a leading finance company reported that of all the float brands, Imperial was the top performer in resale value when it came time to sell or upgrade your float. We can attest to the same as second-hand imperials rarely last more than a few days in our yards and always return a strong resale price. That in itself will tell you a lot about how former and soon to be owners of Imperial floats view the product. At Imperial, we recognise that there are plenty of good looking and sometimes cheaper products in the market, some may even look like exactly like imperials which may be flattering to us, its deceptive to the public. The simple fact is that cheap products (while they may look the part) start out poorly and most certainly do not improve with age. A matching or good warranty will not compensate for low-quality materials and substandard engineering and begs the question, how often are you willing to go back for a warranty and what happens when it runs out. With finance rates at persistent all-time lows along with our highly competitive prices, the difference between a genuine Imperial float and a mass-produced lookalike can be as little as a few dollars a month. Why risk the safety of your horses and your own peace of mind only to lose any initial saving at the time of resale? It is no accident that Imperial is Australia’s leading brand of high quality and affordable horse floats. Imperial Floats – Quality first – Quality lasts.